Comments Off on Announcement: Is TacFit for You? Announcement: Is TacFit for You? Tacfit emerged during a major fitness craze, when consumers began to take their individual fitness goals into their own hands.Basically, instead of hiring personal trainers these days, many busy individuals prefer to order fitness programs. You can pretty much carry your workouts with yourself, everywhere you go these days. If you are looking for a fitness workout that integrates the rigor of military bootcamp with a fun, everyday work out, then you have stumbled upon the right fitness program. What is the TACFIT program? This program basically takes fitness to an entirely new level. It extends far beyond the bounds of traditional fitness methods in order to optimize both weight loss and muscle building results. The reason this program is so different from the rest is that it derived from responses to abrupt, unpredictable, dangerous situations. TACFIT® came from military tactics that entail crisis response, consisting of an organized, level headed approach to disasters of all types. This program was based on such military training and created in order to prioritize health. It is specifically designed to prepare one for all challenges, no matter what they are. This system treats everyone as if they are a star athlete and brings out the best in them. The creators of this system realize that life is never likely a well planned sports match. Instead, unexpected occurrences often happen. When someone is subjected to inconveniences and unexpected challenges, or unfavorable position, they experience a certain degree of stress. These types of crises require a specific type of fitness regimen that can handle these stressors. Essentially, this program can prepare you for the endurance and stamina necessary in any situation. The challenging nature of this program makes it exceedingly effective. When you start this regimen, you will first notice that it is a challenge. When people become crisis responders, they have to be physically prepared. Many physical training exercises incorporate far too much aerobic exercise, and others emphasize too much weight training. This novel program happens to utilize high bursts of intense movement, followed by brief recovery breaks. Many fitness programs do not meet these demands. In this program, you will employ techniques such as reactive strength, functional stamina, coordination, and integrated active recovery. There are many variants introduced to this program, and it is both a psychological and physical challenge as well. This program works for many other reasons as well. It incorporates things such as injury proofing, which enables one to foster a range of different skills. This prepares one when conditions deviate from the norm. The prehabilitation technique prepares one’s joints, joint fluid, and connective tissue. The active recovery stage is a low intensity work out that allows one to recover from spurts of intense exercise. General physical preparedness allows one to steadily adapt to high endurance workouts. And finally, physical preparedness enables one to work in many capacities, including that of surging, pitching, rolling, yawning, swaying and heaving. With its functional, varied and improvised movements, anyone can achieve ultimate fitness through this method. This type of exercise covers myriad techniques. Incrementally progressive exercises must be at certain intensities, and allow one to adapt and respond accordingly. Increasingly sophisticated exercises bolster the neurological exertion associate with specific movements. Effort through efficiency increases the maximum level of quality workouts. And finally, one can minimize discomfort through a maximizing technique. This type of exercise is very challenging. Comments Off on Could You Become a Tacfit Warrior? Could You Become a Tacfit Warrior? This program is based primarily on the tactics used to train soldiers in Israeli counter terrorism. Comments Off on What is the Tacfit Commando program? 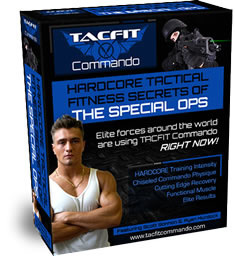 What is the Tacfit Commando program? Tacfit Commando came out just as the general public was beginning to take their fitness into their own hands, people like you value their independence, as well as portability and convenience. For some people, traditional workout regiments do not meet their standards. Perhaps the results are too slow, or maybe they don’t see results at all. In either case, some people want to reach their goal quicker. In addition to this, they want to be fitter and stronger than they ever have. If you have been seeking ways to develop strength, endurance and stamina that allow you to withstand virtually any situation, then Tacfit Commando is the program for you. This amazing program is a subsidiary of Scott Sonnon’s personal training business and is intended to exact one intense Mass Assault after another. This formula can easily load on pounds of lean muscle through dedication and practice.